Color Science has responded to the human quest for brighter colors for 450 years. An interdisciplinary applied science combining the physical, chemical and psychological aspects of how humans see color, color science studies how our eyes interact with a limited array of the electromagnetic spectrum; and the colorants - pigments and dyes, humans use to change colors on surface. Human beings have been changing colors on skin, textiles and surfaces for hundreds of thousands of years. Colors have been used to create symbolic and decorative elements in communication media like painting, drawing and lithography. But, rarely, was color a subject. Not enough colorants were available to make that happen. Colored pigments at the time were chemically reactive. Painters had to expect darkening when vermillion red was placed next to lead white. Also, painters had to mix and apply layers of complex, chemical glazes using dyes to enhance colors. While looking through the 17thC landscape collection at the Royal Museum of Fine Arts in Brussels, I saw which colors were left after hundreds of years. Mostly, I was looking at under-paintings made from burnt umber, sienna, ochre and iron red, colorants which are light stable. Missing were the colored glazes, the painters’ dazzle, their bright highlights on hillsides and fields full of flowers. The glazes faded leaving earth pigments naked like a hillside in winter. Color science lead the Industrial Revolution of the 19thC to produce mixed metal oxide pigments like cadmiums and cobalts. Bright and light stable mixed metal oxides make pure, intense paints that mix into the colors of the natural world. The Impressionists were the first to use these new colors in paints with enough impasto for direct painting techniques. The Fauves on the cusp of the new century were the first to have a complete array of light stable colors in all six hues. Then the color revolution of the 20thC invented a new set of light stable colorants which are non reactive. The modern colors were originally produced to meet the booming demand of the mid century American print advertising industry. Inks and paints made from phthao, azo and quinacridone colors among others make intensely pure, high key colors — not the colors of the natural world. Modern colors are easily recognized by their high key tints. Most art media: oils, acrylics, water colors, pastels, have different binders but mostly contain the same colored pigments so artists have more opportunity to migrate to different media and maintain the same palette of colors. Color vision is a result of human eyes’ capacity to receive a very narrow range of frequencies in the limitless electromagnetic spectrum, a stream of mass-less photons traveling at the speed of light. Light is composed of both wave and particle. Photons are particles of light. A photon’s energy can be measured by its wavelength and frequency. The higher a photon’s frequency, the higher its energy load and the shorter its wavelength. When a photon stream enters into denser transparent media such as moving through air into oil, the stream slows down causing the wavelength to bend (refract). Wavelength is measured in meters (nm - nanometers). A wavelength's speed changes but its color frequency does not change. Throw a red brick into a pool and the brick is still the same color. Frequency determines the color. Frequency is measured in hertz — 1 cycle per second. At color frequencies about 400 THz (Terahertz = 1,000,000,000,000 cycles per second) humans maybe can just see a dull red. The human visual spectrum extends from colors in the longer wave red hue to 700 THz, the edge of Ultraviolet short wave radiation. At the edge of human vision is luminescence. “White light” is a mixture of all frequencies in the human visual spectrum. White light can be dispersed through a specific prism to reveal colors in six hues from short wave to long wave: violet, blue, green, yellow, orange and red. “Hue” and “color” are not interchangeable words. Hue is conceptual and color is actual. A HUE is a bandwidth of frequencies in the human visual spectrum. A COLOR is a single frequency inside a hue. Different color frequencies move through media at different speeds so the angle of refraction (degree of bending) is different for different colors. Wavelengths of color frequencies in the violet hue, for example, are bent the most because violet light has a shorter wave length. Shorter waves travel faster and scatter more than longer waves. Wavelengths in the red hue are bent the least. In the middle is the green hue. While humans have the potential to see six million colors, we see significantly more colors in the green hue than any other. Being able to see colors in the green hue is critical for human survival. Where we see green we can usually find water. After humans stood up over the savannah, we lost our connection to water. No longer able to smell it, we adapted by developing color receptors in our eyes to select for millions of green frequencies from blue/green to green/yellow. In addition to signaling water, colors also signal food. Trees and plants signal human beings when food is ripe. We can see the simultaneous contrast of red apples hanging among green leaves more clearly than unripe apples which are hidden in the foliage. When pumpkins turn orange we make pie. We receive more frequencies in yellow, orange and red hues than in the shorter wave colors in the blue and violet hues. Our eyes work on the same principles as rainbows. Light travels through the air until meeting a transparent media like the cornea. The cornea changes the speed of light and its angle of refraction. Light is refracted again by the transparent vitreous fluid in the chamber of the eyeball then focused on the retina. The retina is considered part of the brain because it develops from the embryonic forebrain. The retina houses the photoreceptors - rods and cones, which are embedded in the brain like spark plugs in an engine. Rods initiate vision when even a single photon of light enters the eye. Rods are rod-shaped, our original mammalian photoreceptors that “see” the relative value between brightness and darkness. Essential for vision in low light situations, rods work best at twilight and dawn. Hunters rely on this value-based vision to see movement along the horizon. Cones are cone-shaped photoreceptors with the potential to receive color frequencies within a range from short wave (violet hue) 380 nm to long way (red hue) about 780 nm. Cones work best in full sun light when humans need to see fine details and subtle variations in color. Human eyes have photoreceptors for colors in all hues within the human visual spectrum. Our eyes cannot “mix” a red frequency with a blue frequency and make a color in the violet hue. Follow link to Dr. Helga Kolb’s work on Webvision for detailed descriptions on human vision and fantastic graphics. Dr. Kolb is a visual artist as well as vision scientist. The author skillfully explains complex chemical reactions like how human eyes stay cool while constantly being bombarded by electromagnetic energy. Visual artists may want to make a habit of jiggling the eyes a few times a day to keep muscles strong. Color vision drops off in low light situations and as we age. Human eyes receive color frequencies via transmitted and reflected light and luminescence. Transmitted light streams through transparent media like air, water and paint binder until it reflects off an opaque surface. Reflected light is composed of color frequencies reflected off an opaque surface. Luminescence is a phenomenon of matter to absorb invisible frequencies then emit them as visible colors that glow in the dark. Human obviously knew before the 18th century how to use crystal prisms to project the hues of the rainbow. But the process was considered accidental and antidotal until Sir Isaac Newton (1642 - 1726) discovered, probably by accident, the precise angle at which white light splits into the six hues. Astronomy obsessed Newton, not color. In 1661 after Cambridge was closed for two years due to plague, Newton had to move home and lost access to the lens grinders who made lenses for his telescope. Rather than wait, he attempted to grind his own lens. He missed that angle but hit the angle that split white light into the full color spectrum. His discovery explained the physics of transmitted light - massless photons streaming at the speed of light. A hundred years after Newton published his OPTICKS in English, Johann Wolfgang von Goethe (1749 - 1832) published his THEORY OF COLOURS in German. His THEORY OF COLOURS did not reach a wide audience because British color scientists rejected Goethe’s “polemic against Newton” and one of Goethe's key theses was lost in translation or lack there of. Newton was interested in the physics of color while Goethe was interested in its physiology and psychology. Goethe challenged Newton’s emphasis on transmitted light and color at maximum. Goethe asked where was the consideration of “value” - relative brightness and darkness. Value is a property of reflected light but not transmitted light. By the property of value, human perceive depth on a 2D plane. By adding black and white to the palette as colors, visual artists can create the illusion of dimension. Maybe Goethe was not challenging Newton at all, he was revealing the distinction between transmitted and reflected light. During medieval times painters established the limited palette using colorants in only three hues: Red + Yellow + Blue. Primarily their goal was to use as few valuable colorants as possible to mix as wide an array of colors as possible. They selected a few red colors, mostly earths + vermillion, a few yellow colors, mostly earths, + an occasional blue, rarely lapis, added black and white and mixed "secondary colors" in the violet, green and orange hues. A limited palette is most costly effective and mostly dull. Colors in transmitted light are not limited to colorants available - light is constantly streaming color frequencies of all six hues until received or reflected. Color scientists since the 1700s have used Newton’s theory of transmitted light to develop devices to split and refocus light. One scientific goal of 19th century color scientists was to mix colors back into white light. This was a particular obsession of Thomas Young, who first observed that photons of light travel in waves. Because the traditional artists’ palette of Red + Yellow + Blue colors mixes into dark grey, he decided to try hues Red + Green + Blue. Conceptually with no scientific data for support, he decided that R + G + B would mix into white light which is physically impossible. RED + GREEN + BLUE light frequencies cannot be mixed into white light. Thomas Young piled on to his hypothesis the notion that human eyes only have photo receptors for colors in his favorite three hues: R + G + B. That notion has endured since 1802. The best part is Young’s declaration that humans only have capacity to receive certain colors frequencies so our brains have to mix colors into the other three hues? The theory is not natural and really confusing. “Additive” R + G + B and “subtractive” R + Y + B color systems are obsolete concepts. In place of “additive,” use TRANSMITTED LIGHT, white light streaming through the universe. Humans eyes are receivers which can refracted white light into various wavelengths we recognize as colors. Colors maintain high intensity until they are reflected off skin, fabric (canvas) and stone. In place of “subtractive,” use REFLECTED LIGHT. When white light hits an opaque surface, some color frequencies are absorbed. The colors not absorbed are REFLECTED back to human eyes. Whether receiving transmitted or reflected light, the process of seeing is the same. The difference is the quality of colors. Reflected colors have value - relative brightness and darkness. Approximately half the natural light we see is grey because we see a combination of transmitted and reflected light. 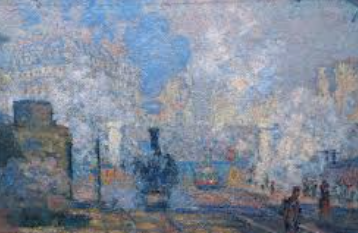 Artists (including the Impressionists) recognize this and use paints in all media including white and black colors to manage reflection and tonality. During the 20th century, art shifted toward abstraction which can rely on color without the dimensional quality of line and graphic image. Through history the quest continues to be for brighter colors. How do you define “warm” and “cool” colors? The easiest answer is the among the oldest. Because most oil paintings are made with a lot of white, consider adjusting the color of white first especially in natural light situations. Adding a tad of blue, adds coolness. Adding a tad of yellow, adds warmth. The third kind of light we see is luminescence. While historically noted by alchemists and philosophers as a natural phenomenon, the bright bioluminescent effect remained mysterious until the discovery of electromagnetic radiation. Nobody knew the limitations of the human visual spectrum until 1800. In less than 200 years color science materialized those rare glimpses of nature’s glow into fluorescent and phosphorescent pigments and dyes, which emit intense color, shine and sheen to contemporary daily life. Among the early explorers of the invisible realms, Marie Curie, physicist and chemist, investigated light frequency emissions from metals. Gold is the only metal that does not tarnish with a frequency emission in the human visual spectrum, which is why we see its color “gold.” Most metals look grey because their color emissions are invisible to human unless we use specialized lamps and filters to see them. About a 100 different atoms are known as metals, the chemical elements which constitute ordinary matter. Most have crystalline structures. Many are transition metals which were forged into the backbone of the 19th century Industrial Revolution. As part of the process, chemists discovered they could manipulate color by mixing metals together under extreme heat and pressure. All grey in their ground state, mixing metals cadmium, selenium, zinc and a dash of sulfur together produces a pigment with an emission frequency inside the human visual spectrum and we see a bright yellow. Instead of composition and perspective, they made paintings from technicolor transcendentalism, Freud's totems and the principle of simultaneous contrast. A hundred years later paintings made with highly saturated colors are so common, are viewers saturated? The quest for bright colors leads to the invisible realm of luminescence - absorbed and emitted light. Luminescence is the capacity of matter to absorb invisible frequencies then emit them as vivid colors just inside the human visual spectrum. Luminescence is cool light, emitted without heat (LED). Incandescence is hot light, emitted with light and heat. Adapting advances in color science to benefit artists usually takes decades or centuries but this time magicians led the way. Bob and Joe Switzer’s experiments with black light lamps led them to make the first day-glo powders in the 1930s. They then made paints with the day-glo effect for their magic shows. The US Military used their technology during WWII. The Brothers Switzer took back their patent and got back in the game in time for the color revolution of the 60s. Black light emits invisible ultraviolet (short wave) light. When a black light lamp strikes colorants amped up with fluorescent powders, humans see intensely bright colors shining in the dark. Under black light, day-glo colors look 200 times brighter than colors in daylight. As soon as the light source is removed, the fluorescent effect vanishes. While only available in a limited palette, more colorants are phosphorescent and emit longer wavelengths from the infrared spectrum. The glowing light can linger for up to 12 hours at a time. The colors fade steadily back to grey within a few years depending on exposure to light. Luminescent colorants are manufactured from phosphors, substances that display the property of luminescence. Phosphors like copper activated zinc sulfide enable crystalline structures to adsorb light and slowly release it. Strontium aluminate is a phosphor 10 times more luminous than zinc sulphide and produces green and aqua hues. Green has the highest brightness and aqua the longest glow time. Fluorescent and phosphorescent colorants are not made from pigments like earth colors. Luminescent pigments are made from dyes dissolved with a phosphor into liquid resinous slurries. After the mixture dries, the colored resin mixture is crushed into various pigment sizes. Over grinding breaks the crystalline structure and the pigments will no longer glow so larger particles sizes are preferred. While the chemical compositions of luminescent colorants are significantly different from chemical compositions of 19thC coal-tar dyes like Alizarin Crimson, the manufacturing method is remarkably similar. Alizarin colors are made by dyeing transparent crystalline pigments like alumina hydrate with chemical 1,2-dihydroxyanthraquinone. After the mixture cools and dries, the dyed pigment is crushed. Just like luminescent colors, Alizarin fades rapidly in all media. For over a hundred years, visual artists have known Alizarin Crimson fades fast and they continue to choose it. Obviously, knowing a color will fade is not enough of a reason not to use it. The current rush to embrace phosphorescent colors is proof of that. Though visual artists have experimented with “neon” and day-glo colors since the 1960s, there has been a notable increase in interest since 2000. Art work made with luminescent materials is to be appreciated in the moment because soon enough luminescent colors all fade back to their ground state which is the color grey.